After an initial deluge of information about system changes in Legion at BlizzCon, Blizzard is busy preparing the player base for followups in the form of class specific blogs. In fact, as I write this article, I am cognizant of the fact that the Death Knight class preview is scheduled for tomorrow. It is sure to contain crucial glimpses into the mindset that drives 7.0 Death Knight design, and will likely be the basis for the onslaught of feedback to follow. So, on to the obvious question: Why is this column, which will likely have been published after the blog, being written prior to its release? Quite simply, because it focuses on one major change to Death Knights that was announced at BlizzCon and is significant enough to be worth its own post. Back in March of this year, I predicted that the rune system was likely to see a fundamental redesign after Warlords of Draenor. This prediction has now been proven true: In Legion, Blood, Frost and Unholy runes will no longer exist. Death Knights will instead have six permanent Death Runes that act as a unified resource. To my current knowledge, the rune system will continue to obey other rules that we are familiar with: Only three runes will be capable of regenerating at the same given time (albeit, without the restriction of being paired), and spending runes will still generate Runic Power, which in turn will fuel further rune regeneration — though details on the nature of rune regeneration in 7.0 are a little fuzzy. The foremost question on everyone’s mind is likely: What does this mean for us? How will it affect our rotations? How will it affect our class’s unique standing among the masses? What does this change hope to accomplish? The first thing I’d like to address is a complaint that I’ve seen pop up everywhere in the last 48 hours: The notion that, as a result of this change, Death Knights will be reduced to two-button smashing wonders where they continuously spam a single rune-based attack, then a corresponding Runic Power dump. Let me state this clearly and unequivocally: This. Is. A. Fallacy. I can understand where this concern comes from, however — when players think of Death Runes in the present system, they imagine something that offers them rotational flexibility in an otherwise rigid system. As such, Death Runes almost seem like “bonuses” that can be spent on more powerful/crucial abilities, before lapsing back to a standard rotation that obeys the concordance of Blood/Frost/Unholy runes. However, this is not the case in Legion — by designing a system with only one rune type, Blizzard has forced itself into a position where it must adjust and, if necessary, redesign rotations to accommodate this. Thus, thinking about this new system in tandem with existing rotations is a futile exercise, because our current system exists in a space where the functionality of Death Runes is defined by their relation to other types of runes. On the other hand, I’ve also seen complaints from players who are saddened by the fact that they this removes a great deal of the uniqueness from the class. This is something that I can personally relate to quite well, as I previously noted how our resource system was one of the most engaging in the game. I consider this to be especially true for players that currently take on the added challenges of incorporating talents such as Plague Leech and Blood Tap into the rotations, and juggling with the complexity that playing with abilities such as Breath of Sindragosa brings in relation to our resource system. It’s for this reason that I should also note that I take strong exception to Kris Zeirhut’s assertion (timestamp 0:20:50 if you were curious) about the current rune system promoting a “faceroll” class. I can understand where this perception might come from — as with any class, playing a Death Knight at a mediocre level isn’t difficult. One can large ignore runes, opt to take passive talents such as Runic Empowerment or Plaguebearer, and generally perform within a margin acceptable for most Normal mode raiding. However, to state that this was true for the class as a whole is to deny the challenges (and, correspondingly, fun) that executing a complex rotation with some of the other talents I mentioned requires; not only is that reductive, it is naive. Even back in March of this year, I suspected that whatever revamp runes might see would involve simplifying the system. 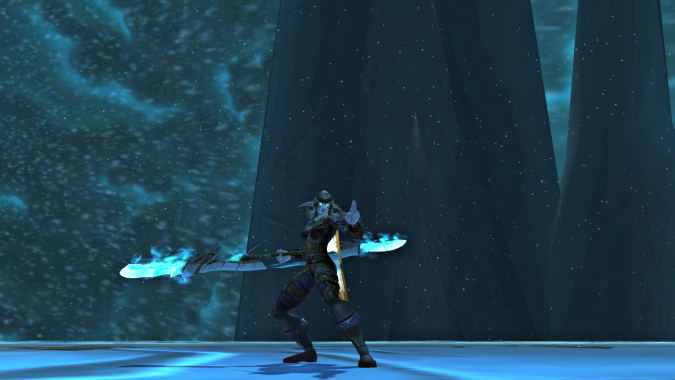 Although this might be difficult for some to understand, one complaint I often hear from people trying a Death Knight for the first time is that the rune system is so “different” from anything they’ve encountered in the past that they become discouraged from going beyond a few levels on their new character. While I empathise with this complaint, I would assert that the faulty design does not lie solely within the resource system itself. 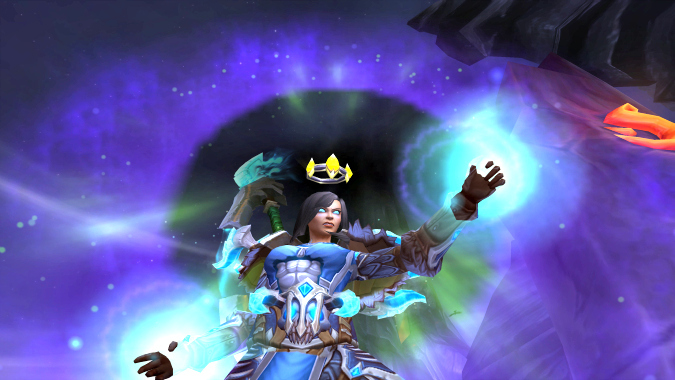 Consider, for example, that the current Death Knight leveling experience is an utter mess. We don’t gain access to rune regeneration talents until Level 60 (Level 75 in Mists of Pandaria), which means that newer players often do not complete the starting zone due to the mistaken impression that the class is unbearably slow. Another example is a starter quest that presents the player with a pair of blades they must use to “persuade” an enemy to talk — only now, Blood and Unholy Death Knights are incapable of dual-wielding, and thus are often confused as to why the quest seems to take so long to conclude. Finally, the haphazard manner in which we obtain many of our abilities/passives can prove confusing enough to some that they do not comprehend how the rune system interacts with them (i.e. how smoothly many costs actually are) until maximum level. “But Mag,” you say “Surely Blizzard aimed these changes at improving the experience of existing players as well?” While I’m certain that that was indeed their goal, I cannot say that I believe it was the best solution to the problem. Aside from improving the beginning experience for new players, I consider the greatest flaw of the Death Knight class not to be its resource system but its talent tree. More specifically, I am pointing to the rune regeneration tier of talents as being a prime example of the kind of silliness that Blizzard wished to avoid existing with talents in the first place. I talked about this in a previous column, but the main argument I am trying to put forward here is that I feel Blizzard is misdiagnosing the problem. Rather than addressing spec-specific awkwardness (Unholy AoE and Frost Runes being a good example) and fixing what is an inherently badly designed row of talents with literal trap choices, they are opting for an approach that renders both irrelevant. While I can see the appeal in doing so it is also an approach I cannot, in good conscience, condone completely. I did note earlier that complaints about this new system being “faceroll” are as silly as I found Zeirhut’s claim about the existing system, so I don’t want people to come away with the impression that I am unhappy with Blizzard for the wrong reasons — they are fully capable of building a cohesive class experience on this, and I’m sure they will. What I do feel, however, is that a great deal of the gameplay and depth that the existing rune system offers is being nullified when it truly doesn’t need to. But then, I’m just one individual whose thoughts are no more valid than others on this subject. By the time that this blog goes Live, it is likely that our class preview will be out and help contextualise where I’m coming from. If there is also one insight that I would offer the community as a whole, it would be to pay attention to statements made by developers regarding overall themes/goals for class design. 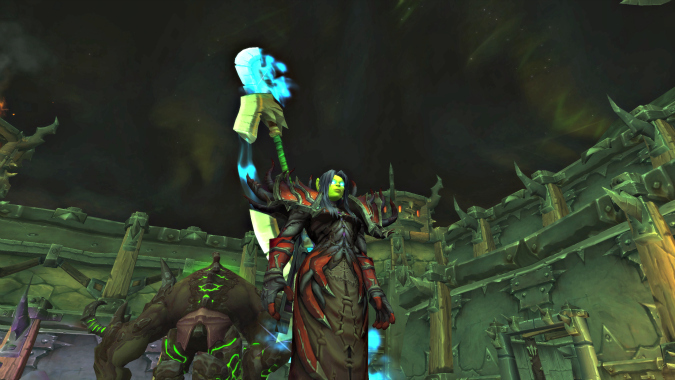 An excellent example is Zeirhut’s statement about “more unpredictability” being introduced for many specs — I believe that this offers valuable insight into what we can expect for how our rotations and talents for Legion are being shaped. Furthermore, I would remind readers that the blogs we are currently seeing are only previews: They are intended solely as primers, and do not provide any meaningful insight into what we can expect with talents, Artifacts and a variety of other class modifiers. Because of this, I caution against getting overly excited or upset (excesses of both are harmful) when there’s so much more to come. In fact, the best piece of advice that I can give in regards to previews is to consider every new spell/change in the context of a greater class. If something looks super cool (or bad), ask yourself how it would feel as part of a larger toolkit in that role. In my next column, I hope to discuss the implications of the rotational previews that our upcoming blog will show us.